Another chapter of the Metropolitan Mortgage & Securities Co. debacle nearly closed Thursday as the state receiver sold the defunct company’s largest asset – insurance affiliate Western United Life Assurance Co. The roughly $53 million deal calls for Global Life Holdings LLC to purchase Spokane-based Western United, which the state’s insurance commissioner seized in 2004 as Metropolitan sought bankruptcy protection. The sale gained court approval last month. It remains unclear how much of sale proceeds will benefit Metropolitan’s former investors, or when they would be paid. 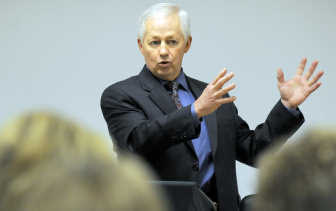 Addressing about 50 Western United employees Thursday, Insurance Commissioner Mike Kreidler lauded their tenacity. Western United, which sells tax-deferred annuities, remained solvent during the receivership. But Kreidler’s office overhauled the insurer’s investment portfolio after finding many of its real estate assets were inappropriate for a state-regulated insurance company. It was important to find a buyer that would keep Western United as a viable company, rather than liquidating its assets, Kreidler said. Trustee Maggie Lyons, who oversees the trusts set up to repay Metropolitan Mortgage investors, could not be reached for comment Thursday. Western United employed 185 after it separated from Metropolitan, compared with 60 today; but more than half of those who left chose to quit, said Senior Vice President Scott Cordell. For those still employed, “It brings closer in their mind that the issues of the last four years are over, that we can look at a new future, a company that gets to be able to go back to doing the business we enjoy doing,” he said. Under the deal, outstanding shares of Western United stock will be redeemed, and new shares of Global Life will be issued, according to the insurance commissioner’s office. The agreement included about $5 million in cash, an estimated $15 million in real estate that must be sold, and a $33 million reinsurance claim of affiliated company Old Standard Life, according to the commissioner’s office. Creditors could receive an additional $2 million upon the sale of property in Texas. Proceeds will go to the creditors’ trust, rather than a separate trust as previously proposed, said Stephanie Marquis, a spokeswoman for Kreidler’s office. The deal was formalized in a boardroom of The Davenport Hotel. Kreidler and other officials signed forms laid in about two dozen stacks on an emerald-colored marble table under crystal chandeliers. But while signatures were finished, the money transfer was delayed until Friday morning, Marquis said. Global Life, a joint venture between Global Secured Capital LLC and DLB Capital LLC, is committed to maintaining and growing Western United, said Richard Kearns, president of Global Life.